The Date is SET! 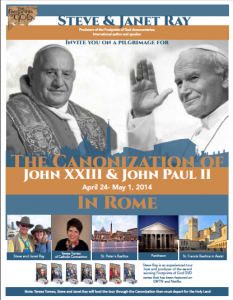 Canonization of JPII is April 27! And We Will Be There – Join Us! The Pope and Cardinals announced it! The date is finally set! April 27 is Divine Mercy Sunday and we will be in Rome to celebrate this historic event! Join us on this pilgrimage. Not only for the canonization but a full tour of Imperial Rome with its Roman Forum, Coliseum and the Mamertine Prison where Peter and Paul were incarcerated before their executions. We will also tour Christian Rome including the four Patriarchal churches of Sts. Mary Major, Paul outside the Walls, and St. John Lateran with the Chair of Peter. Tour the Vatican Museum, visit the Sistine Chapel with Liz Lev and a thorough tour of St. Peters. Private Masses at holy places including the Catacombs. We will also have a day trip to visit Assisi. Mass will be celebrated at the Church of St. Francis and we will visit the tombs of St. Francis and St. Clare. And much more like amazing dinners and excellent food and wine. We will have the best guide in Rome, Liz Lev speaking at the sites, we will see Pope Francis up close at the General Audience. St. Gianna holding her daughter who we will meet in Rome! NEWS FLASH! Did you know that St. Gianna was the last saint Pope John Paul II canonized? 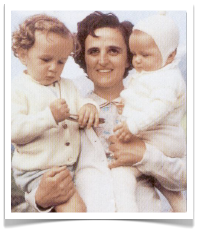 St. Gianna was pregnant with Dr. Molla, the daughter for whom she heroically gave her life. Special Benefit!!! We will have a private meeting with Dr. Gianna Molla, Saint Gianna Molla’s daughter. Other amazing guests are also in the planning. For more information visit our website www.FootprintsOfGod.com or call Suzanne at 800-727-1999, ext. 121 or sparran@ctscentral.net. These are the kind of priests that go with us as chaplains on our pilgrimages. Fr. Scott will be with us three times again in the near future. You will enjoy this fun, profound and excellent homily on the Beatitudes preached while overlooking the Sea of Galilee.